CO-FOUNDER of Asian Food Channel (AFC) Hian Goh has his eye on funding other start-ups using funds freed up by the sale of AFC a year ago. 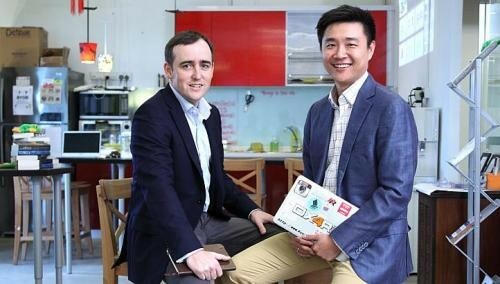 In the wake of the sale to US network Scripps Networks Interactive for an undisclosed price, Mr Goh teamed up with former investment banker Shane Chesson to start venture capital (VC) firm Silicon Island. The firm expects to invest in 15 to 20 tech start-ups in the finance, health-care and other areas over the next six years. Mr Goh, 39, said they will be "investing between US$2 million and US$4 million in each start-up". That is the equivalent of S$2.5 million to S$5 million. The venture capital firm wants to give start-ups money known as Series A capital that they can use as growth capital to expand their marketing and enter new markets. This comes after seeding funds. Silicon Island will be among a handful of local venture capitalists, such as Vertex Venture Management, with the financial clout to offer this sort of funding. Mr Chesson, 39, an Australian, said that in the last two or three years, the quality and quantity of start-ups have risen and the firms provide a good pipeline for investment. Seed funding has been easily available and this has financed many start-ups as they look to commercialise new products and services. Many are now ready to scale up their businesses and need growth capital. "There's pent-up demand for Series A funding, and before capital in this area becomes competitive, we want to put our foot in early," said Mr Chesson. The two men met in the early 2000s, when they were investment bank executives with Citigroup and Solomon Smith Barney. Mr Goh co-founded AFC about nine years ago with former BBC journalist Maria Brown. In 2010, both men started Pivotal Asia Ventures to fund start-ups. To date, they have funded e-grocer Redmart, online restaurant booking start-up Chope and big data company Crayon Data. These three investments will be transferred to Silicon Island as Pivotal Asia Ventures is now a dormant firm. Backing up Silicon Island is Northstar, a Singapore-headquartered private equity firm, managing more than US$1.2 billion. It also holds a fund manager licence from the Monetary Authority of Singapore. Silicon Island will be Northstar's VC arm. Both Mr Goh and Mr Chesson are employees of Northstar. Mr Chesson believes Northstar provides potential co-investors with an assurance that proper financial procedures are in place for each investment and that there are regular financial audits. They are looking for co-investors here and overseas. "This is an advantage. When we talk to deep-pocketed investors that we bring into the region, we don't have to explain why we're here. "The fact that Northstar is an approved fund manager in Singapore is evidence that Silicon Island is a sound VC."